In the 1750’s, potatoes arrived in Norway. The Priests early on appreciated potatoes in Norway. The Priests discovered how healthy the potato as it helped people that were sick because of the vitamin C. As well it was easy to grow potatoes in the Norwegian soil. The Priests spread the message the importance of eating potatoes from the pulpit. This how the “Potato Priests” arose. 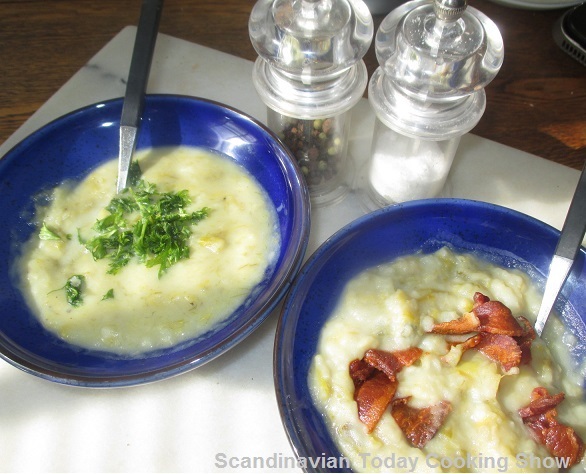 Here is a simple Norwegian potato soup to make which only has 7 basic ingredients. 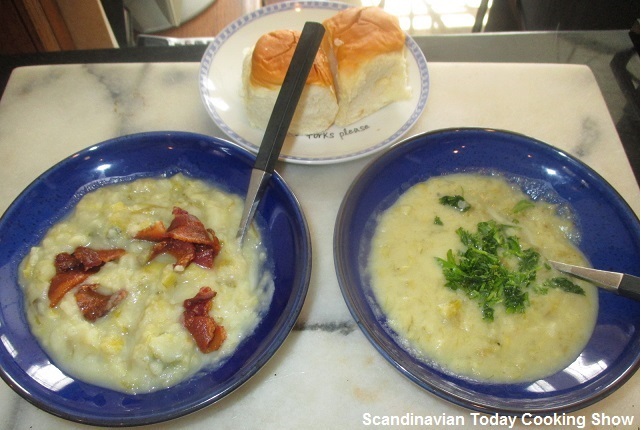 See our recipe video to see how Karen Grete makes the Norwegian Potato Soup. Put sliced potatoes and chopped onion in a heavy 2-quart saucepan. Add milk, butter and pepper. Return to the heat and add milk, slowly, stirring continuously. This soup can be adjusted easily to add additional flavors such as chopped bacon or other herbs too. As well you might like fresh ground pepper according to your taste too. 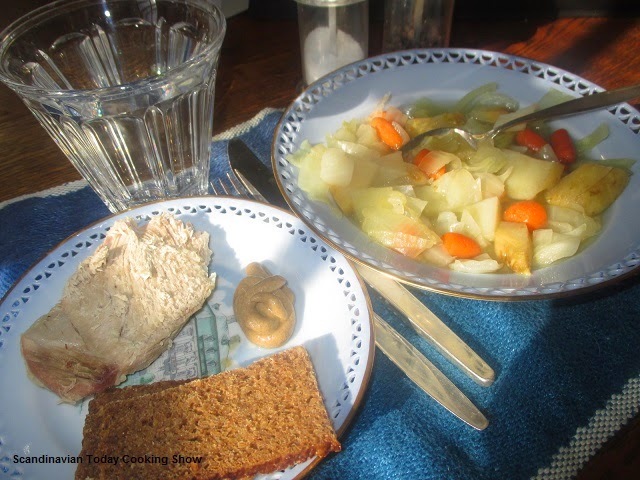 I like to serve the Norwegian Potato Soupwarm with a slice of rye bread. This is a simple recipe with just a few basic ingredients. Perfect to make when you don’t have much in the refrigerator. Especially if it is cold outside and you don’t feel like running to the grocery store to buy groceries, this is a perfect soup recipe to make. Cook the fish and shrimp in water. Remove the fish and shrimp from the fish stock and cook the vegetable and (frozen) mussels in the fish stock. Remove the mussels from the fish stock. Melt butter and add flour and cream and let it cook for approx. 5 min. and add the fish stock with the vegetables. Add the cooked fish and shrimp. Simmer for a couple of minutes and add the cooked mussels. Sprinkle with the parsley and chives, and add salt and pepper to taste. ♥ We hope you enjoyed our video and recipe! We have had a few months of really cold and snowy winter. During the cold weekends, I make this hearty bowl of potato leek soup on a regular basis. My family loves this recipe as it is comfort food for them. The bacon and parsley gives the soup an extra touch of deliciousness. It might take a little effort to make this hearty soup but it is worth it. When this soup is done, wow! Peel and slice the potatoes and cook them in the chicken stock. Slice the leeks and fry them in the bacon fat. Mash the potatoes in the chicken stock and add it to the garlic/ leeks mixture. Cook till soft and tender. Add the cream, salt and pepper. Serve the warm soup immediately. I recommend to sprinkle with bacon, chives and/or parsley. I usually serve the soup with either rolls or Danish rye bread too. You can’t go wrong and the compliments will be forthcoming especially during the cold winter months. Enjoy! 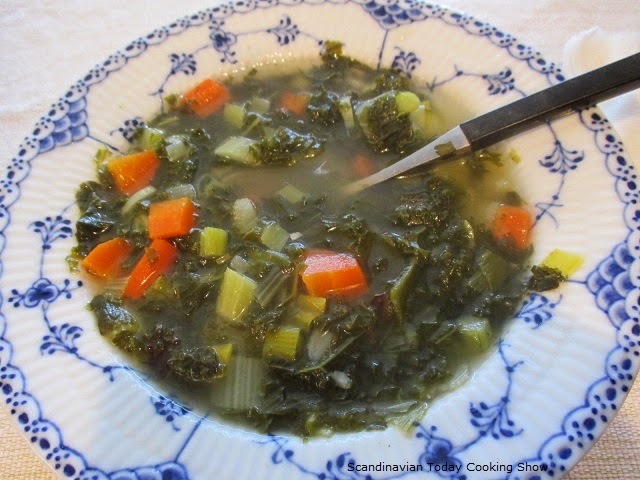 This is our Danish version of Cabbage Soup! Healthy & Good! What to eat with Cabbage Soup? 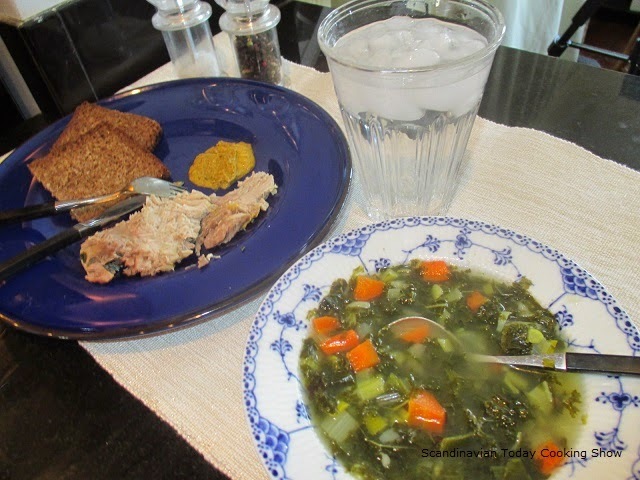 Traditionally, we serve cabbage soup with pork, a slice of rye bread and mustard. 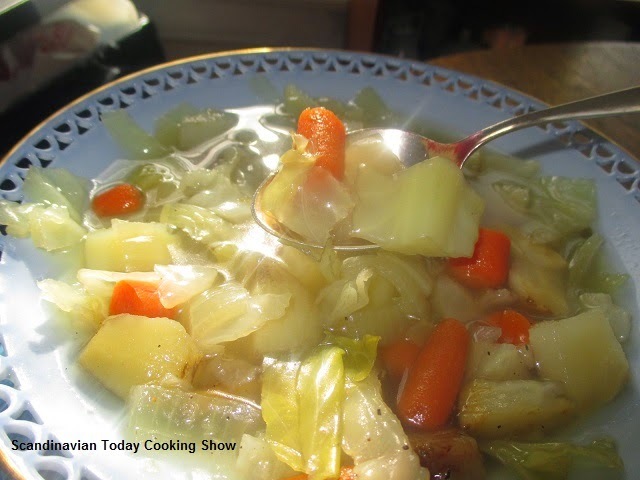 Click on our YouTube video to see how Karen Grete makes this delicious cabbage soup! In a large pot place the meat covered with water and bring to a boil. Remove foam from soup, add peppercorns, salt, onion, celery leaves, bayleaf, and parsley. Let it cook on low heat, covered for about two hours. Prepare the vegetable, slice the cabbage, peel and cut the celeriac in cubes, slice the onion (or leek), peel carrots and potatoes and cut them into cubes. Remove the soup from the heat and remove fat. Bring the soup to a boil and add the prepared vegetables. Let it cook for 15-20 min. or till everything is tender. Add salt and pepper according to taste. Doesn’t this soup look soooo good! 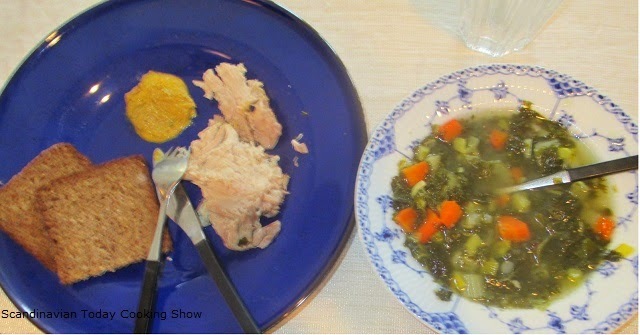 Remove the meat from the soup and serve it sliced on a separate plate with mustard and rye bread. Enjoy! 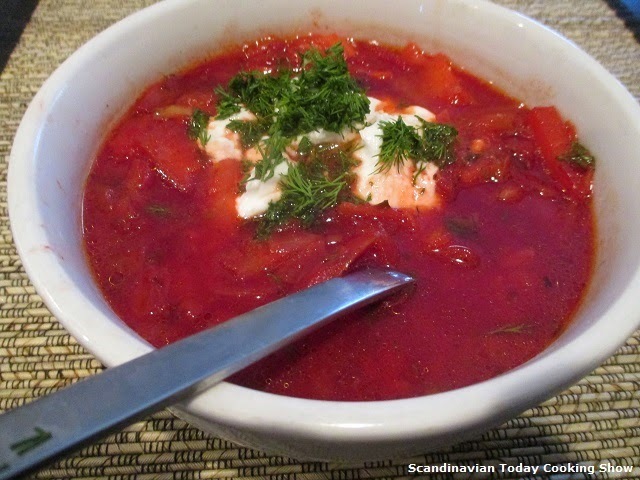 This is our Finnish version of a Red Beetroot Soup! Healthy & Good! What to eat with Red Beetroot Soup? 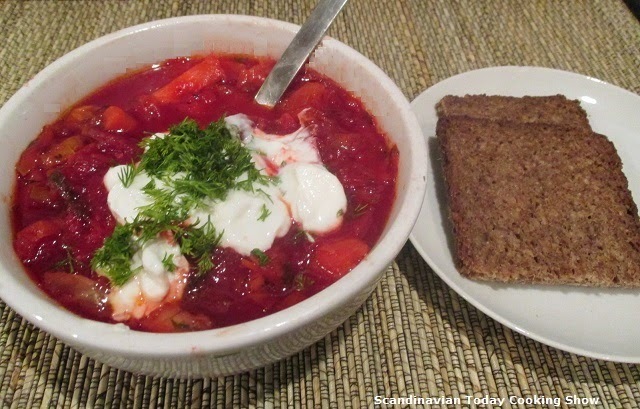 Traditionally, we serve beetroot soup with sour cream on top with a slice of rye bread. Add and saute the chopped onions, potatoes, beetroots. parsnip, carrots, celery stalk, white cabbage and leek. Bring to the boil. Reduce heat to medium-low. Simmer, partially covered, for 45 hour or until vegetable is tender. Season with salt and pepper to taste. Ladle soup into bowls. Top with sour cream. Sprinkle with chives. Check out our easy rye bread video too!